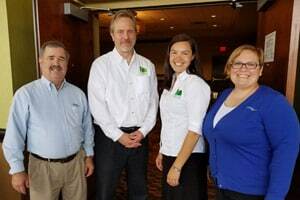 Melissa Ploeckelman and Scott Heiberger attended the First Annual Dairy Plant and Field Reps Conference in Eau Claire on August 23, 2017 in Eau Claire. The Cooperative Network put on a new program for factory representatives that visit dairy farms on a daily basis. One area of importance at the conference was sharing the message of safety when they get out to the farms. Two resources were highly recommended to this group; the UMASH Farm Safety Checklists that are coming out monthly via email and the Ag Youth Work Guidelines that have a mobile friendly webpage. The participants appreciated the resources and had great conversations about how they can be farm safety champions. Participants also discussed who is already serving as safety champs on the farm. Many said the owner, the spouse of the owner and the “Farm Mom” are the people they want to talk to if they are sharing news about safety on a dairy farm.